"We ran into a few logistical problems during our set up, which was no fault of anyone in particular, and GOTR was flexible and accommodating. GOTR is affordable, professional and very friendly!" 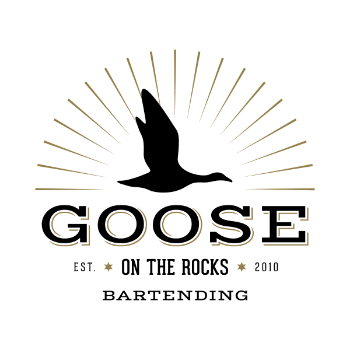 "I hired Goose on the Rocks for the fundraiser event, Viva La Muxer 2016, which had an attendance of 2,200, and they were amazing!! They worked with us during the planning to create a menu and bar set up ideal for our event. During the event, we didn't have to worry at all because their AWESOME staff had it all under control and the bars ran smoothly." "We booked them at least 6 months in adviance and after my first conversation with Benson, I knew we had made the right decision. Benson was very professional, always prompt in responding to my many emails and very detailed in planning..... Our guests loved the drinks, the friendly service and the lines moved fast." "I started talking to Benson about 6+ months prior to our event. My main goal was having an open bar. Secondary was looking for a flexible bartending service that would create good drinks and be cost efficient. There are plenty of options for fancy services offering "bespoke cocktails" that look amazing if you have tons of money to spend, but unfortunately, we didn't so our guests would have to settle for "normal" cocktails. One of the reasons I chose GOTR was because of Benson's understanding of our needs and ability to come up with solutions to help us reduce costs....Looking back, I'm really had I trusted his judgement on everything. he was especially helpful in creating our signature drinks and making sure there were plenty of items to be able to re-purpose... All of these discussions really highlighted his care and attention to detail. " "I've had the pleasure of working with Benson and his Goose on the Rocks team a few times at the SCBG. After seeing how professional and kind they were during a wedding they there, I asked them to join our preferred vendor list." "The day of the wedding all we had to do was deliver the alcohol a couple of hours early and his team and himself came to set up. They provided a menu on the chalkboard for us. I LOVE that!! Benson is quick with returning emails and text messages. It felt like talking to a friend. Benson and his team also managed out rowdy family and handled everything professionally. I am very happy we met Benson because he not only provided amazing service but his personality and charm made it even better!! At the end of the night, he packed up all of the left over alcohol in boxes and make sure we knew where they were." "He made me a shopping list of the things I needed to buy fo the big day and how much of it I needed. He drew out the inventory list to fit my budget, and after our final meeting, he told me to relax and to just enjoy my experience from thereon out, assuring me he and my coordinator will handle it." "Benson and GOTR team were great on my wedding day! My guests had nothing but amazing things to say about his team!! One of them even brought me a cocktail right before the ceremony--how awesome is that?!! My guests were also obsessed with the signature cocktail that Benson and I collaborated on!--it was a BIG hit :) TRUST me, his team is aaammmazzzzing--all super sweet with the best attitude."